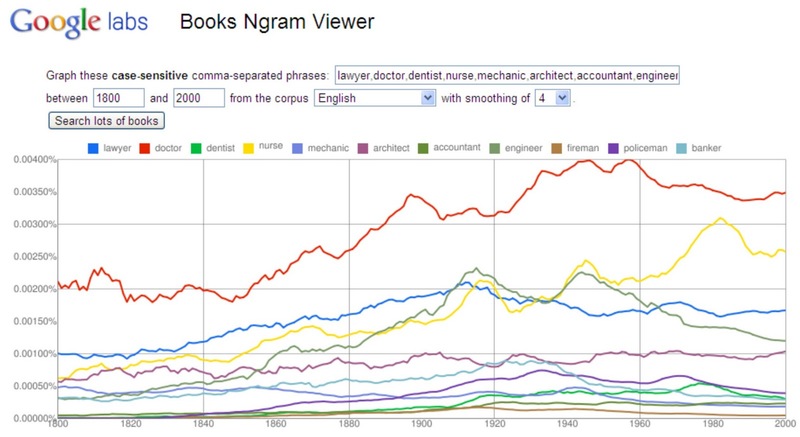 It's being touted as a valuable tool to compare macro trends since 1500 A.D., graphing how words and phrases have been used over selected years. 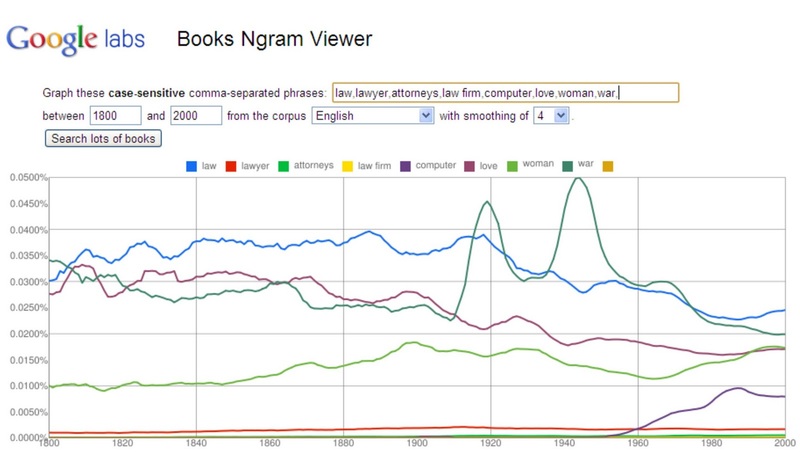 So, for example, I conducted a search for usage of the words "Law" and "Love" since 1500, below. 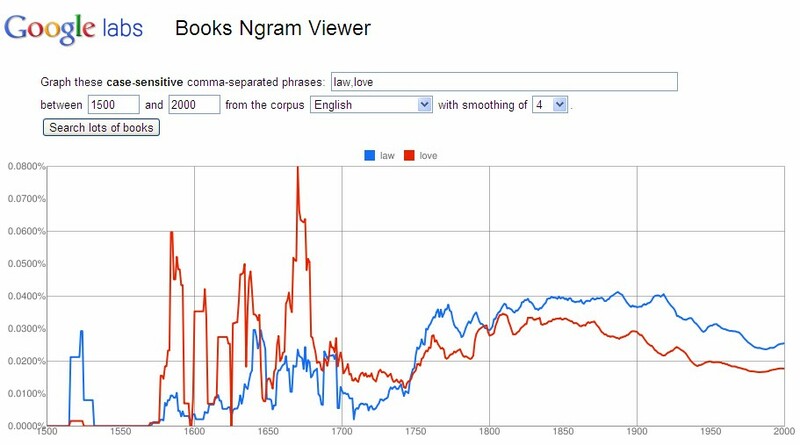 "Love" was intermittently all the rage between ~1575-1675, judging from all the spikes. Then, general interest in Love flattened out around 1700, and Love was overtaken by Law around 1750 where it has remained. 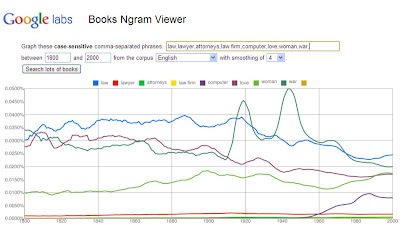 Or here's a search for law, lawyer, attorneys, law firm, computer, love, woman, and war. 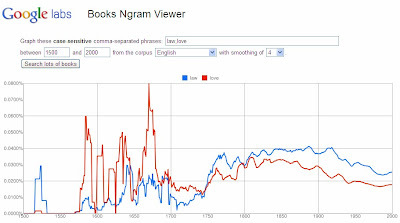 To prove the concept, in the line graph below, you can see how dramatically use of the term "war" spiked around the dates of the two World Wars. Further, I'm not sure what it means, but beyond "Love" (see above), "Law" (blue) also generates higher numbers than "Woman" (light green). 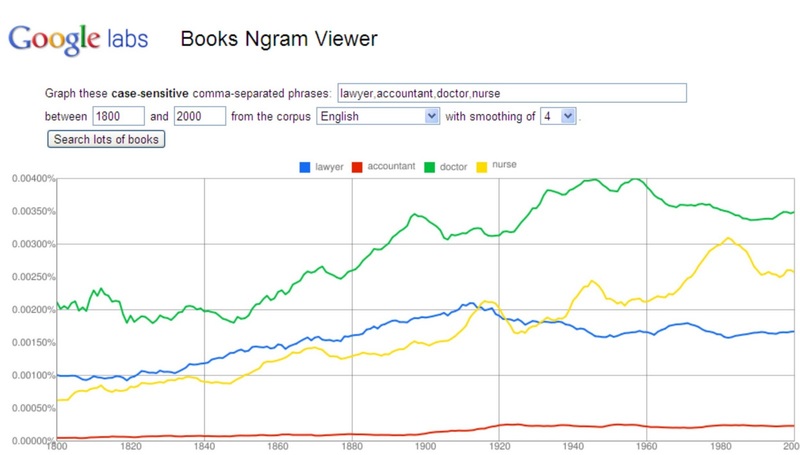 Words like "lawyer," "attorneys," and "law firm" are barely measurable by comparison. 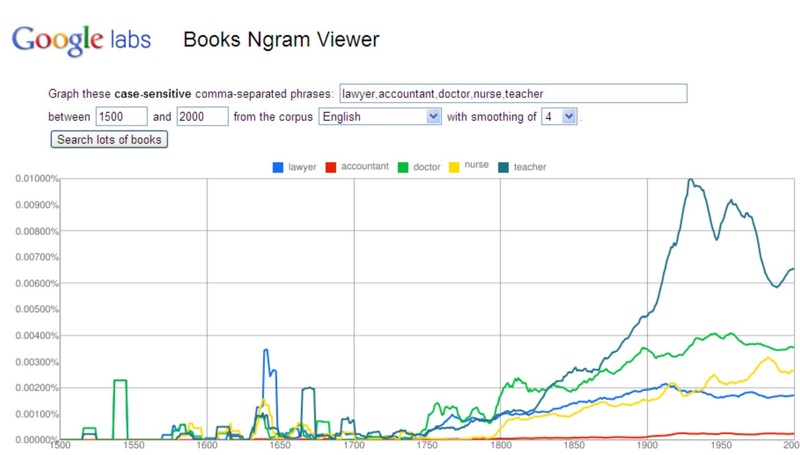 In the lower-right corner you can see how "computer" (purple) starts to gain usage around 1960. 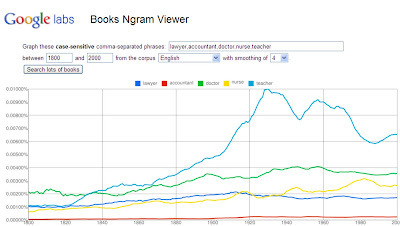 Comparing four professions since 1800 below, "lawyer" (blue) has significantly higher usage than "accountant" (red), which never generates much interest. 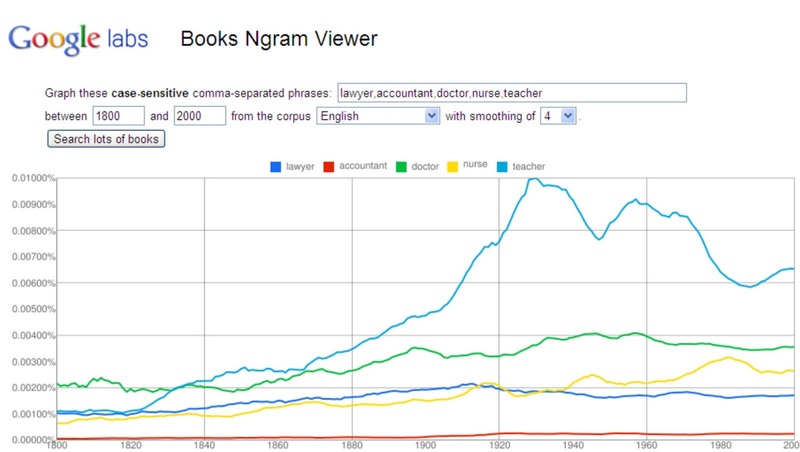 "Lawyer" held a slim lead over "nurse" (yellow) from 1800 until around 1920, then gets overtaken around 1930, and never recovers. 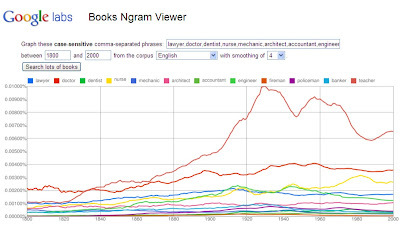 "Doctor" (green) has always held a sizable lead over all of these professions. 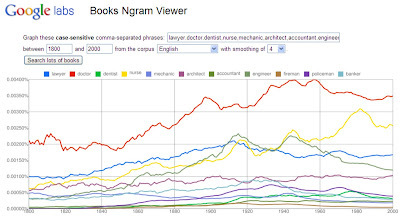 Here's how that same search looks when conducted over a 500-year span. 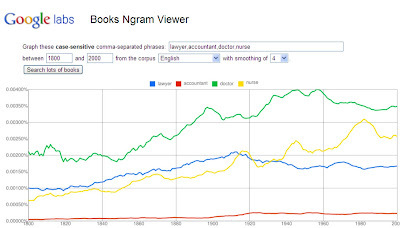 There's a curious blue "Law" spike just before 1650, which may relate to "The Habeas Corpus Act 1640." 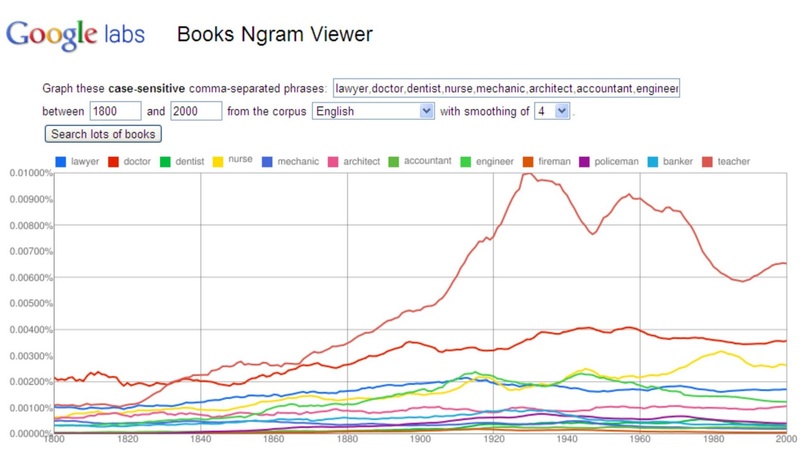 Here's the same 200-year search on 11 different professions, including accountant, architect, banker, dentist, doctor, engineer, fireman, lawyer (blue), mechanic, nurse, and policeman. 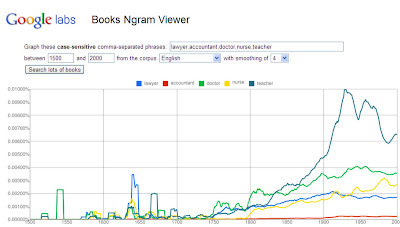 "Doctor" (red) holds a strong lead over Law and other professions. . . They may not get paid what they're worth, but apparently there's still a lot of interest in Teachers.